Photo by Janet Loughrey (c) all rights reserved Sedum lidakense produces a stunning combination of smoky blue and amethyst foliage that cloaks this low mounding stonecrop. The purple gray buds explode into clusters of starry rose-colored flowers. A Great Plant Picks selection. 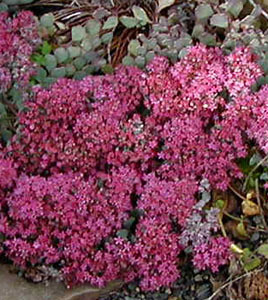 This has recently been moved from Genus Sedum to Genus Hylotelephium. Late summer. 6 in. x 12 in.